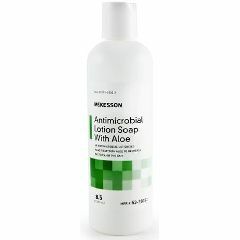 AllegroMedical.com presents The Antimicrobial Lotion Soap with Aloe. This McKesson Antimicrobial Lotion Soap with Aloe comes in a 8.5oz squeeze bottle with easy to close flip top cap. Antimicrobial lotionized hand soap with aloe decreases bacteria on the skin when applied. Antimicrobial formulation–helps protect against cross-contamination and contains PCMX to help eliminate disease-causing germs. Lotionized–aloe gentle on the hands for long term comfort. Neutral pH to help protect skin and is not made with natural rubber latex. Not sticky. skin sftening. pleasant smell. great value. easy to use. quickly absorbed by skin . woman. longterm disability. wheelchair bound. look for better solutions. Clean hands after toileting, before touching any item needed to transfer back into wheelchair; hands dry quick &amp; clean w/o slipping on grab bar especially. Need to take care not to pour out too much lotion (thin consistency) or it takes too long to soak into skin.